Ceiling fan rotation cuts energy costs. 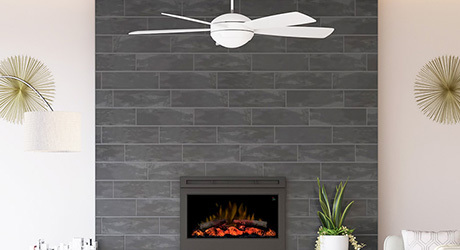 Learning which way ceiling fans should turn is easy with this guide; it explores summer fan rotation, how to reverse ceiling fans in winter, and which ceiling fan direction is clockwise or Ceiling fans have long been used to create a breeze in summer months, but their usefulness in the winter often goes overlooked. By simply adjusting the direction of its rotation, a ceiling fan can become a great asset in warming the home. In order for this adjustment to be effective, the fan must be set to rotate in the appropriate direction. This guide will teach you how to select the correct ceiling fan direction in summer or winter alike. Most fans are built for year-round use, and taking advantage of this can help homeowners improve their energy savings. According to estimates by the U.S. Department of Energy, correctly using a ceiling fan can save on both cooling and heating costs. When used in conjunction with air conditioning in summer, you can raise the thermostat 4 degrees with no loss of comfort and recoup up to 30 percent on your energy bills; in winter, you can expect to cut costs by up to 15 percent. To fully realize the savings, you must get in the habit of turning off the ceiling fan when all the occupants have left a room. The fan operates by making people in the room feel cooler or warmer, rather than changing the temperature of the air itself. Therefore, shutting the fan off when the room is empty ensures no electricity is wasted. Installing a ceiling fan with a remote control or a ceiling fan switch makes it much easier to control the ceiling fan operation, and many remotes offer fan direction changes at the tap of a button. Absent a remote or wall switch, ceiling fans have a reverse switch on the motor housing. Check the location of that switch before you purchase a new ceiling fan to be sure that it is easy to reach. Ceiling fans should hang between seven and nine feet from the floor with a minimum 10-inch clearance between the ceiling fan blades and the ceiling. If you have vaulted ceilings, hang the vaulted ceiling fan from a downrod to get the appropriate positioning. If your ceilings are somewhat low, you may be able to use a flush mount ceiling fan. See our ceiling fan buying guide for more information. Tip: Remember that indoor ceiling fans cannot be installed outdoors. A ceiling fan should rotate counterclockwise in the summer so that the blades push cooler air down in a column. The counterclockwise rotation is typically set by pushing the directional switch on the side of the motor housing down, but you may need to check your fan's instruction manual to confirm. 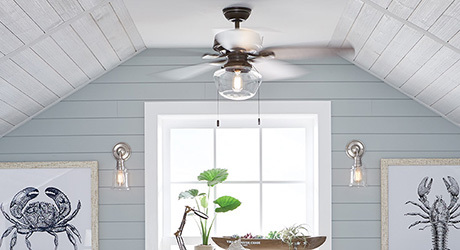 If you are unsure if your fan is turning the correct direction, stand directly under the fan and look up: if the fan is moving counterclockwise and you feel a rush of air, it's in the correct setting for summer. If you don’t feel much air movement, it’s possible that the fan is spinning in the wrong direction. Turn off the fan and wait for it to completely stop rotating, then switch the fan rotation by flipping the direction switch. 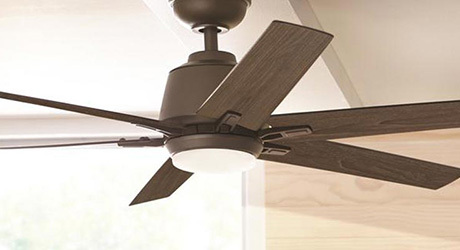 If there is still no air movement when you turn the fan back on, or it is very weak, your fan may have a failing motor or the pitch of the blades may be too flat. Consider upgrading to a newer ceiling fan. Remember, while a good ceiling fan can take the edge off of a very hot summer, it does not actually cool the air in the room. The ceiling fan improves air circulation and creates a breeze that you feel on your skin, a “wind chill” effect. To maximize the effect, the fan should be turned on to its highest speed. If this produces instability in the fan, see our guide on how to balance a ceiling fan. Being advised to turn a fan on in winter may seem like the opposite of help, but even in winter ceiling fans can be used to help manage the interior climate. Ceiling fan rotation in winter should be clockwise and the fan should run at the lowest speed. This pulls cool air up toward the ceiling, which in turn displaces the warm air that rises and collects near the ceiling. The warmer air disperses down toward the floor and along the walls to make the room feel warmer, allowing you to lower the thermostat. The low speed prevents any drafty “wind chill” and keeps the airflow steady and consistent. When standing under the fan, look up and double-check that the blades are rotating in a clockwise direction. There are a few exceptions and modifications to the ceiling fan summer and winter rules that you can use to control the air flow in your home. Vaulted ceilings. Leave the fan on the counterclockwise setting year round since the height of the fan mount makes it unlikely you’ll feel any wind chill. Dining Rooms. To keep the fan from cooling your food too quickly, set it to turn clockwise at a medium or low speed. There will still be air circulation to cool you, but it won’t be as intense. The same can be said if you are working on paperwork at the table or perhaps playing cards. A fan set to medium and turning clockwise will keep things from blowing everywhere. Smokers. Set your ceiling fans to run clockwise when you have a family member or guest who smokes indoors. This will draw the smoke up and away. If possible, open a few windows or turn the AC fan to exhaust to help the smoke leave the room. Outdoor Pest Control. 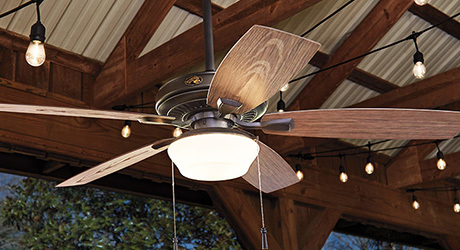 An outdoor ceiling fan on a porch or covered patio will follow many of the same rules as above for cooling or ventilation. You can also use it on summer evenings to help with insect control. Turn the fan on and have it rotate counterclockwise at high speed. The force of the air will help to keep mosquitos and other flying insects away.